Part one took us from Torrance to Manhattan Beach on the L.A. Beach Bike Path. This article is part two so if you are starting here, you may want to navigate to part one first. Part Two: LAX, Manhattan Beach to Marina del Rey. North of Manhattan Beach Pier, the bike path continues along the edge of the sand and keeps us well up the beach from the surf. Up a level to our right is The Strand where beachfront homes look out upon this classic L.A. Beach scene. Pedestrians, runners and kids on toy scooters, tricycles and bikes with training wheels are up a level from the bike path, but you will find that they use the bike path just as much. We should remember that a non-local may enter the bike bath between any posted signs and therefore not realize that it is reserved for cyclists. I usually approach them with a casual “on your left” or at worst, “please step off this bike path” rather than show rudeness. Don’t worry, some road bike racing speedster will soon happen by with a more strongly worded message for these walkers. Up until this point we have experienced only slight variances in gradient, few climbs and few coasts, so on your your KickPed, Xootr, Razor A5, Micro Adult White, or whichever scooter you are the proud and enthusiastic owner of, it has been a nice ride. Of course the key to enjoying a kick scooter or push scooter ride in a scenic place, or anywhere else is to take it easy. Even at a speed that feels very slow, any pedestrian that you pass will have dropped into the distance behind you after a few seconds, so you need feel no obligation to pursue your maximum speed. The slower you go, the further you go. At 45th Street the path bends slightly left and right to pass some gasometers and at this point, Mile 7 of the bike path, we exit Manhattan Beach and enter the City of El Segundo, the fifth city so far on our South to North scoot along the bike path. In the El Segundo area we see a much more industrial landscape. Just offshore, oil tankers unload Alaskan crude into pipelines terminating at large buoys. These pipelines carry the oil to the refineries that we can see inland of the L.A. Beach Bike Path. There is a slight chance that you may have to take a break if anyone is using the Chevron Refinery Heliport which is right beside the bike path. You are free to pass during a take off or landing, but you risk being sandblasted from the rotor wash.
At Grand Avenue, we scoot out of El Segundo and find ourselves for the first time in Los Angeles, our sixth city. Here at Mile 8, when you reach the first swooping left and right curve of the path you have the honor of passing by all the sewage of Los Angeles. Just inland from the bike path, and across the street called Vista del Mar is the Los Angeles Sanitation Department’s massive wastewater treatment plant. No need to worry though as on most days the ocean breeze is enough to prevent any trace of odor from intruding upon your ride. When I had my KickBike I would regularly park the car in Playa del Rey and scoot a round trip to Manhattan Beach, but I have never done this on my KickPed. As lovely and huge as this section is, it is a better suited to riding a swift bicycle. The kick scooter ride through here is long and arduous and no matter how much you love beaches and scooters, it can become uninteresting after half an hour when the tiredness builds. Assuming though that you will be seeking to do the whole twenty six mile path in stages, there is much of interest here nonetheless. When you pass Imperial Highway at Mile 9, there is something just out of sight to the right, LAX. Every minute or so a jet will take off from one of the four runways and fly over the bike path and out to the Pacific, where it will turn to select a flight path to wherever in the world it is headed. The sound of jet engines is constant here and it merges with the traffic up on Vista del Mar and with the ocean surf to create a background roar that is quite unique to where we now are, Dockweiler Beach State Park. The bike path snakes around on this large beach, making a long stretch even longer. The gradient also changes so you have to power up hill, but get some nice high-speed downhill coasts as reward for your effort. But the difficulty of this section is dependent upon the wind. It may be your friend or your foe. It can change directions, and on some days of the year, you will even see the planes approaching LAX for a landing from the ocean instead of the other way around. In years past, it was not unknown for lone cyclists to be held up and robbed along this stretch of the path. I only go through during a busy weekend and I keep an eye on any suspicious characters if I find myself far from other riders. Criminals here are in an isolated spot so if they take a victim’s mobile phone, they can be far away by the time police can arrive to help. But I don’t want to scare everyone away from Dockweiler. If you goal is to complete the path, then you have to ride through. During one of these curving swoops of the path, approximately between the two pairs of LAX runways, we pass into an area of Los Angeles, that we call Playa del Rey, our seventh town. Playa del Rey has an upper level way above the elevation of the bike path, and a smaller area down at sea level. Just past Mile 11, you can take your scooter off the bike path at Culver Boulevard and look for some coffee and food in the lower village section of PdR. A century ago, before there were roads and towns, Playa del Rey was a beach resort serviced by the old Balloon Line streetcars out of Los Angeles, which is fifteen miles inland from here as the crow flies. Then, as now, Ballona Creek emptied into the Pacific at Playa del Rey and there was a lagoon called Del Rey Lagoon, which is a remnant of what was once Mud Lake. Mud Lake was no more when the Army Corp of Engineers constructed Marina del Rey, the world’s largest man-made yacht harbor. This entire coastal area was part of an extensive marsh system called The Ballona Wetlands. Some of this has been preserved, but most has since been developed, first by the Hughes Airport, used for the production of WW2 aircraft, and lately by housing. Officially, the L.A. Beach Bike Path stays on the sand here until just before the channel of the creek, where it curves around and crosses a bridge to a spit of land that separates Ballona Creek from the entrance channel of Marina del Rey. Unless you have a magic flying scooter, in order to get to Venice on the other side, you need to take long inland detour as the bike path heads inland around Marina del Rey. 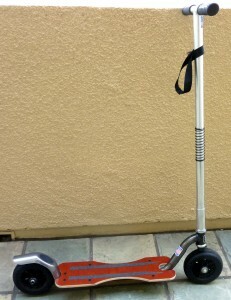 NYCeWheels have no immediate plans to sell a magic flying scooter. After crossing this bridge, which is a nice place to stop and enjoy the view, the bike path is a nice downhill from our Playa del Rey end, passing Mile 12, until we get to the split between the twenty six mile L.A. Beach Bike Path and the Ballona Creek Bike Path. We will not cover the Ballona Creek Bike Path in this article, and we will hang a left and find ourselves for the first time, sharing the road with motor vehicles and the bike path becomes a bike lane on Fiji Way, Marina del Rey, our eighth town. But it would be shame not to stop here as we are now in Fisherman’s Village and here we can walk our scooters and enjoy food, coffee, a boat ride, or, if it is the weekend, outdoor live music. It’s not a bad place to take a break, and in fact I got married here at Shanghai Red’s. Continuing on the bike path, which is a bike lane on Fiji Way, we pass Mile 13, the halfway point. Then we eventually have to cut across four lanes to make a left turn onto the section of the bike path that snakes past the boatyards. This Marina section is actually a nice ride on a scooter and less so on a fast bicycle. Of course we do not strictly have to use the Fiji Way bike lane at all. Instead of riding in the bike lane beside the cars, we can stay on the other side of the road, where Fisherman’s Village was, and we can ride the sidewalk and detour through the parking lots of The Boatyard and West Marine, and generally have a fun time on our scooters just as we would in town. Assuming we are sticking to the path, it resumes across Fiji (just past Mile 13), and curves within Admiralty Way, crosses Mindanao Way and Bali Way, affording us close up views of hundreds of docked boats, and eventually leads us into the parking lot of the Marina del Rey library. We have to cross Admiralty Way at the traffic light and then the bike path is separated from the road in a nice green park where it gets an additional local name, The Marvin Braude Bike Path. Halfway through this section at the beacon that shines straight down the main channel of Marina del Rey we are at Mile 14. I have ridden this section for decades on bikes and scooters, but I should warn that around twenty years ago the Los Angeles County Sheriff Bike Patrol used to hang out here and give citations to roller skaters who are technically forbidden from the bike path. On any given day you will see many skaters here, and everywhere else along the twenty six miles, but I do not really know where we legally stand with our scooters. No-one does. At the end of the Marvin Braude, we again have to use a crosswalk to continue down a bike lane on the far side of Washington Boulevard. This is now Venice, our ninth town. Cars will be passing us on our left, but again, no reason we cannot scoot on the sidewalk if it is a more relaxed experience. This street eventually takes us back to the shore, passing the Venice Canals at Mile 15 and then arriving a couple of blocks later at Venice Beach. I will save this famous ride for part three. Marina del Rey is also a nice place to ride a kick-scooter if you ignore the L.A, Beach Bike Path altogether. Riding the sidewalks there are nice routes around each yacht basin and there are nice quiet streets around the Marina Peninsular and the Grand Canal. The actual Venice Canals, on the North side of Washington Boulevard should be reserved for walking, as there is no room to ride, but it is handy to carry a scooter anywhere in this area. 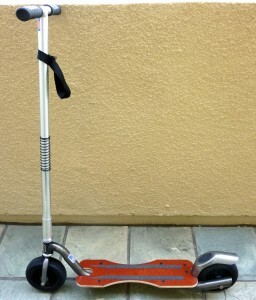 I doubt that anyone would ever ride a folding scooter all the way from Manhattan Beach to Venice in one day, but you can take this a section at a time depending on your strength and endurance. Always remember, as I said in part one, whenever you take a long scoot in one direction, you need to have enough energy to get back again. Of course if you do over-extend yourself, you can always take a taxi back!